“We identified serious violations that are important to inform ICE of immediately,” the Department of Homeland Security’s Office of Inspector General said in a report released this week. The management alert outlines a number of “issues requiring action” discovered by inspectors from the independent office when they conducted an unannounced visit to the Adelanto ICE Processing Center in May. The facility, located about 80 miles northeast of Los Angeles in Adelanto, is owned and operated by The GEO Group, a private prison contractor that runs a number of large immigrant detention centers in the United States. “ICE takes seriously the OIG’s findings, and has agreed to conduct a full and immediate review of the center to ensure compliance with detention standards and expedite necessary corrective actions,” agency spokeswoman Lori Haley said in a statement. Detainees also noted sometimes the bed sheets were used to create privacy within cells, or as clotheslines. But given that a man died after being found hanging by his bedsheets in a cell at Adelanto in March 2017, and that at least seven suicide attempts have occurred at the facility, the report says ICE should prioritize addressing the issue. “ICE’s lack of response to address this matter at the Adelanto Center shows a disregard for detainee health and safety,” the report says. The report cites a 2017 Los Angeles Times story, which described at least four suicide attempts at the facility and notes that detainees had gone on hunger strikes to protest conditions there. A disabled detainee asked to be placed in administrative segregation but instead was placed in disciplinary segregation and “inappropriately held” there for nine days, according to the report. ICE uses “disciplinary segregation” to describe the practice more commonly known as solitary confinement. After inspectors raised the issue with a medical health services administrator, the detainee was moved to medical for observation, according to the report. Another detainee interviewed by inspectors said he’d been waiting more than two years for cavities to be filled and had multiple teeth fall out in the meantime. “Our detainee interviews and review of medical records revealed that detainees are placed on wait lists for months and, sometimes, years to receive basic dental care, resulting in tooth loss and unnecessary extractions in some cases,” the report says. A review of records found that no detainees had received fillings in the last four years. “When we asked one of the dentists why fillings were not performed, he said he barely has time to do cleaning sand screening, so as a result he does not do fillings,” the report says. ICE should conduct a full review of the facility and GEO Group’s management, the inspector general said. Haley, the ICE spokeswoman, said the agency concurred with that recommendation. “Adelanto, like all ICE detention facilities, is subject to stringent, regular inspections. Any compliance issues found during such reviews must be promptly addressed,” she said. GEO Group didn’t immediately respond to requests for comment. The company bought the facility in 2010 and entered into an agreement to house ICE detainees there in 2011. In a statement included in the OIG report, ICE said it would be conducting its own inspection of the facility this month to gauge whether it complies with the agency’s detention standards. The Trump administration has pushed to expand the use of detention facilities to hold immigrants who are in deportation proceedings. An average of more than 40,000 detainees are in custody daily at ICE facilities, according to government statistics. Immigrant advocacy organizations have long criticized the Adelanto facility, where more than 1,600 immigrant men and women were held when inspectors visited in May. On Tuesday, advocates argued that the government watchdog report proves that officials haven’t taken meaningful steps to address years of complaints. This isn’t the first time that the inspector general has warned of problems in ICE detention. 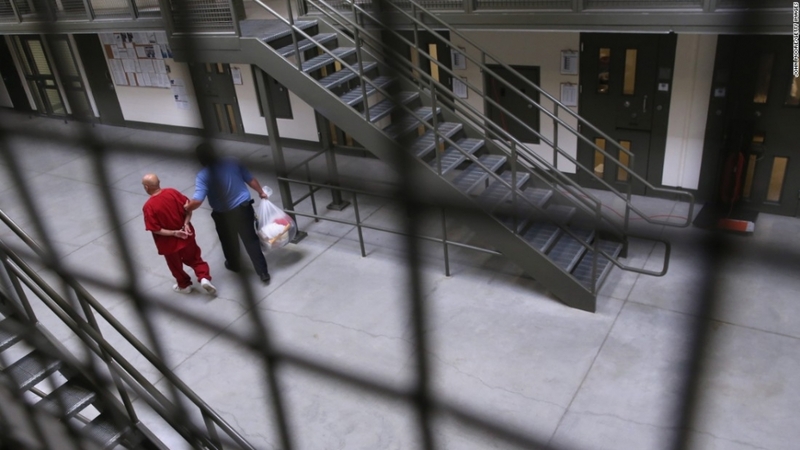 In a December 2017 report, the watchdog said inspectors had found long waits for medical care, possible misuse of solitary confinement and inappropriate treatment of detainees at several US immigrant detention facilities. Advocates argue the recurrence of such findings in surprise inspections shows the inadequacy of ICE’s own monitoring efforts. The agency maintains that it ensures facilities meet standards through an “aggressive inspection program” and an oversight office that conducts compliance inspections and reviews detainee deaths. CNN’s Sonia Moghe, Chris Boyette and Stephanie Becker contributed to this report.